1. Peel, core, and chop apples setting aside. Chop onion, pepper, and set aside. 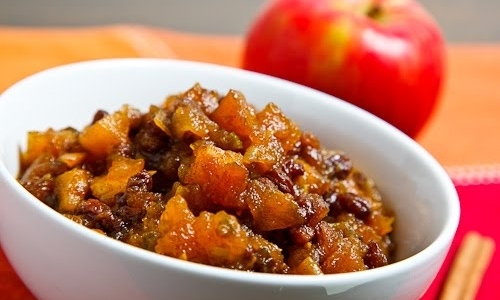 In a medium-sized stockpot, add apples, pepper, sugar, onion, raisins, and vinegar. Bring the mixture to a heated boil, and reduce heat to medium, Boil for 20 to 25 minutes, or until apples, are tender, and mixture has thickened. 2. Next add in lime juice, curry powder, clove, nutmeg, cinnamon, and sea salt. Continue to boil the mixture for another 6 minutes. If you would like to preserve your chutney, I would recommend canning it. This will allow the chutney to last longer.